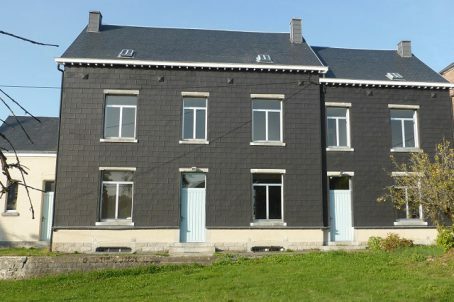 Home › For sale › Belgium› Bed and Breakfast › Exceptional Double House, Ideal For Bed And Breakfast. For sale: Exceptional double house, ideal for Bed and Breakfast. Unique property consisting of 2 houses of the mansion type with large garden in front and a nice barn / parking on a plot of 1.888 m2. The house is presented with renders in order to give you a good idea of the possible decoration and potential of the house. The details such as the authentic floors, wooden trusses, beautiful wooden doors and fireplaces, etc. were meticulously renovated. The left house with a habitable surface of 333 m2 has been completely renovated while retaining the beautiful authentic elements. Entrance hall, large bright living room with wooden floor, beautiful wood carved doors, beautiful fireplaces, kitchen (still to be set up), room or desk, utility room and storage room, toilet. On the 1st floor one reaches through the night hall, 4 large bedrooms, a toilet and an extra multifunctional space. On the 2nd floor. is the bathroom, a 5th bedroom and 2 adjoining rooms (45 m2 and 11 m2). A practical dry cellar. The right-wing home has a habitable surface of 207 m2, also completely renovated. Entrance, bedroom + bathroom, large living room, kitchen, storage. On the 1st floor are 2 large bedrooms, a desk, toilet, dressing room and night hall. Via the staircase access to the 2nd. with a large attic space of 33 m2 and 16 m2. Dry cellar. The large barn / workspace of 87 m2 also offers various options such as storage or parking for bicycles / motorcycles, room for various purposes, meeting room, ... .. Very exceptional double building with love for the style and the authentic materials refurbished so that it has won back its full charm and soul. Ideally located in the center of Carlsbourg (Paliseul).